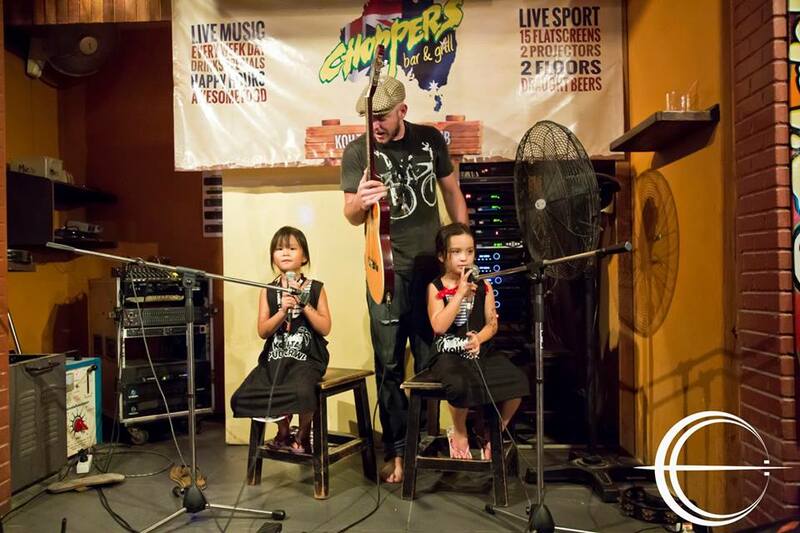 Gig Profile: Chopper’s Aussie Bar and Grill Koh Tao, Thailand. I’m very blessed to be doing what I’m doing. Traveling the world sharing my music and making a living doing so. In an effort to help out those that dream of doing the same thing, I’ve decided to start writing up the details of the venues that support my art – and my wallet – as I go. 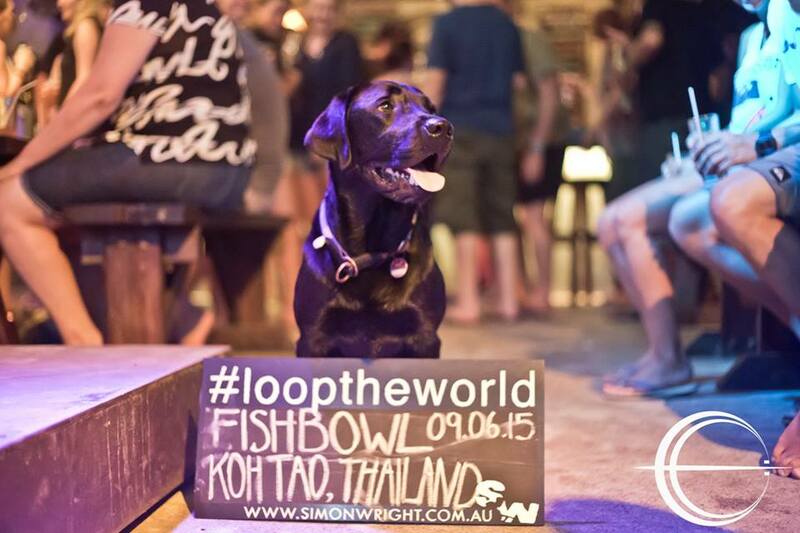 This will be the first ever #looptheworld Gig Profile and where better to start than at Chopper’s Bar on Koh Tao in Thailand. I first started performing at Chopper’s back in 2013 just 2 weeks after buying my loop station. One might say it was my international debut. It’s a crazy gig. Hot, sweaty, full throttle Thailand madness. Every Monday, Wednesday, Friday and Sunday they hold a pub crawl on the island and I’m the entertainment for the hour and a half they spend at Choppers. It’s the biggest bar crawl in S.E Asia boasting an impressive 180 max capacity and regularly sells out. The gig starts at 9pm and consists of 2 sets. The fist set I play to a bar of seated patrons enjoying a meal and their first drinks for the evening. This is a great opportunity to share my original music and warm up to what happens next…. At 10pm the pub crawlers arrive – 180 drunken maniacs. They squeeze into the already busy bar and quickly fill the dance floor. 5 minutes into the second set they are dancing on the tables and having the time of their life. The gig is very demanding. The second set is long, hot and sweaty. By the time I finish I’m absolutely exhausted. 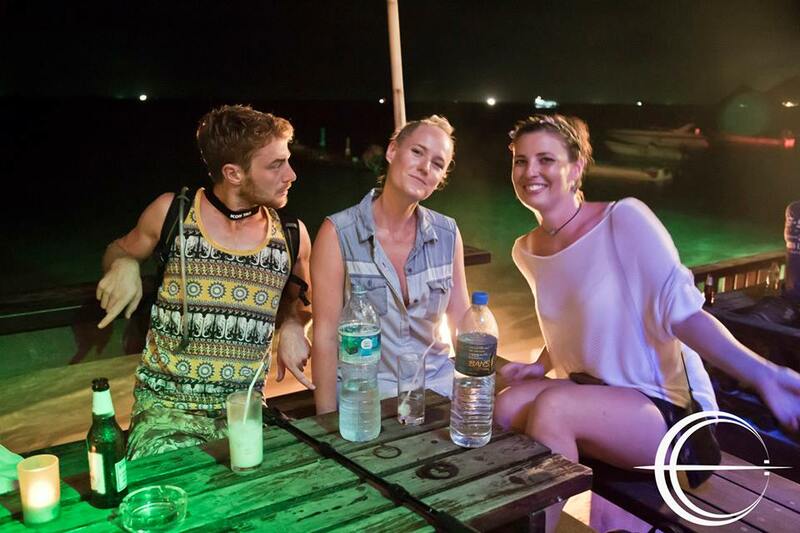 A few weeks on Koh Tao and you’ll be more gig fit than you’ve ever been. I often loose weight on Koh Tao despite the efforts of the Banyan Bar staff and their Sunday roast. The combination of Thai food, hot weather and Chopper’s marathon gigs trims off the winter belly better than any diet the internet is trying to sell you. Jeff, Chopper’s Bar Owner, will offer you up to 4 shows a week. If you back that up with some shows at the other bars on the island as I do you can easily end up playing 7 nights a week. 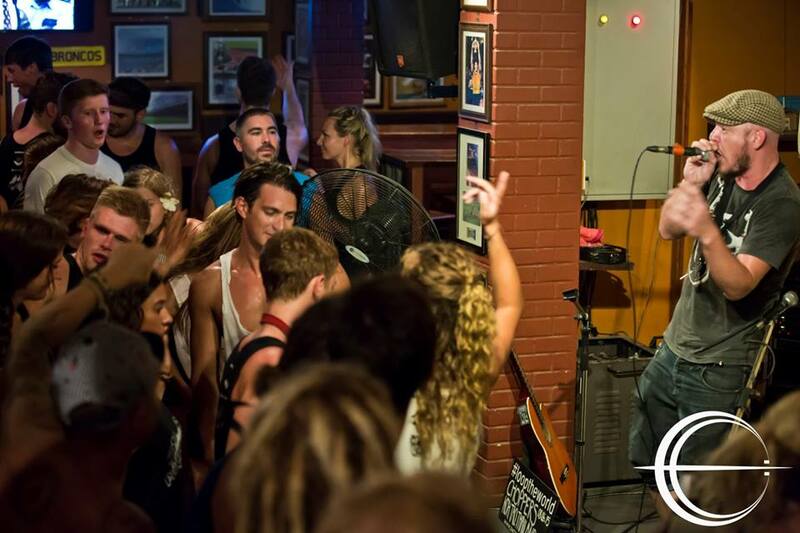 A professional photographer shoots every pub crawl so you are likely to get a few good shots. I love playing Chopper’s but I wouldn’t suggest it to those that aren’t prepared to work hard in the hottest gig environment you are likely to encounter. If it does sound like something you’d be into feel free to contact me for more information. Alternatively get in contact with Jeffrey Glenn and send him a video of you performing live. You’ll need a pretty decent repertoire of high energy, up tempo cover material. That said, you can get away with playing your original material -particularly in the first set. No sound man so experience in running a PA helps. 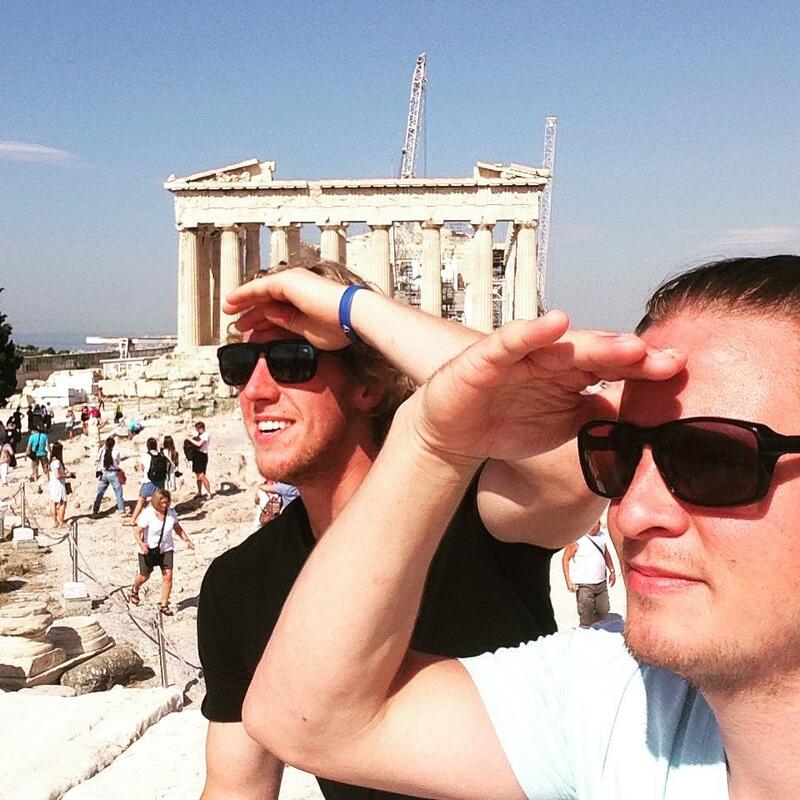 Mike and Chris looking for John Stamos in Athens. 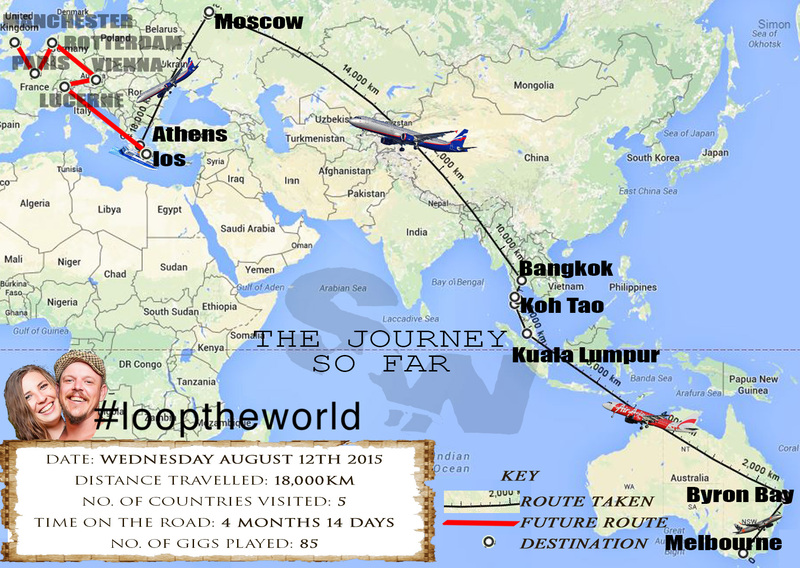 Each month we have a guest blogger write an article for the #looptheworld Letterbox. This month we have the wonderful words of Chris Penner. 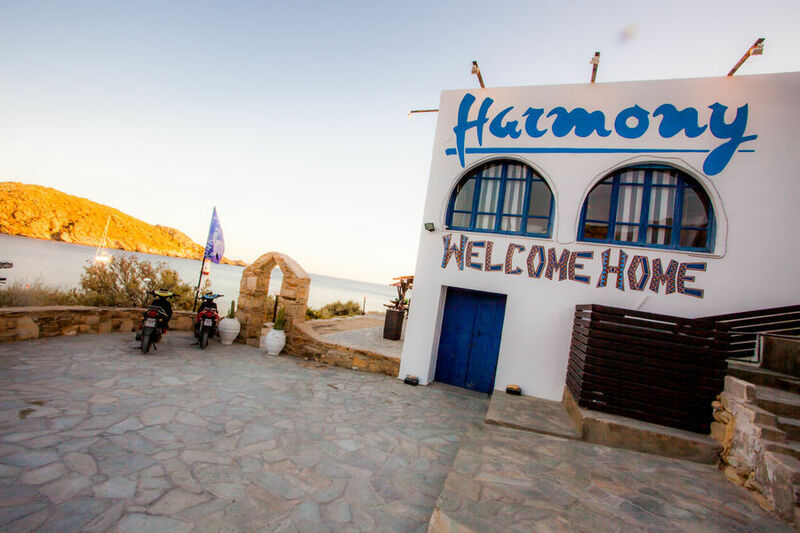 We first met Chris at one of my shows at Harmony on the island of Ios, Greece. We instantly got along really well, as I often do with Canadians. After we’d hung out a few times, Hannah and I agreed he would be the perfect candidate for our guest blogger this month. He confirmed that with his enthusiastic response when we asked if he’d be interested. Thank you so much for your words Chris. I hope you all enjoy this colourful perspective of the beautiful island of Ios. For those highly unfortunate souls who are unfamiliar with John Stamos, he is an actor who portrayed Uncle Jesse in the 90’s blockbuster television show Full House, alongside the Olsen Twins and Bob Saget; however, more importantly John Stamos is the most handsome Greek man of all time. Even before I wrote this I did a quick google search on the Greek god and one of the first articles was “John Stamos still has amazing hair and side burns”! Have Mercy!! On June 8th this year my close friend Michael Budd and I decided we would venture to Greece in the hopes of finding this “ómorfo ándra” (beautiful man). It was less of a hunt considering we had jobs lined up on the island of Ios to teach watersports for Mylopotas Watersports on Mylopotas beach, so much repetition in that sentence, my English teacher would be so proud. So! We spent two nights searching the bars in Athens, knowing full well he lives in the U.S.A., we hopped on the ferry to Ios, with an Irish guy named George who we’d convinced to join us, and started our summer in Ios. As a very sheltered Canadian from outside Toronto, whose travel experience includes all-inclusive resorts in Costa Rica and Mexico with my family, the move was a bit of a culture shock. Not in any dramatic fashion because Ios is still a tourist destination, it’s not like we were shitting in pots or practicing Ainu Bear Worship, it was the little things. The pace was much slower than Toronto, which should go without saying, and in no offence to Greece, but we realized once we were on the island that we were on Greek time. Meaning if we sat down for dinner expect to wait a bit longer, if you’re told something will arrive in 5 minutes, expect it to be a about 15. This concept wasn’t very difficult to grasp considering the beauty of this island, you can sit, relax, tan, soak in the majesty of what is Ios and colour me surprised, I learned to love it. Furthermore what really shocked me were the showers. Never in my life did I think I would yearn for a showerhead. For those in Canada reading this you’re probably thinking “Cant wait for hockey season to start” but after that you’re thinking “what do you mean lusting for a shower head?”. While I was using the washroom in the first place Mike and I stayed at, I asked where the showerhead was, not realizing it was stuck to a hose in front of me. If you’re lucky the water is hot but you have to spray your body, soap up then hose it all down like you’re getting rid of all your change at a cheap car wash. But that is the extent of my displeasure. “I’m Living in Paradise” This is a sentence I repeat to myself everyday. I say this to myself on the walk down to work from the village, when times get a bit frustrating at work and mostly when I see the sun set on this island and I truly believe that. I have never been to a better place in the world. It’s sunny everyday, the temperature is perfect, there are never any clouds, and it’s acceptable to drink every night. But beyond the weather and the acceptance of alcoholism are the people. Before I left I had my very tight group of friends that I was content with, more than content to be honest, I never considered travelling and as much I love meeting new Canadians I was a bit apprehensive of experiencing new cultures and people. Will it be difficult? What are they going to think of me? Will we get along? Will they be rude or closed minded? Which turned out to be the complete opposite and my absolute favorite part of travelling, besides the late night wakeboarding, sunset cruises, smashing drinks and skinny-dipping as the sunsets over the Mediterranean. 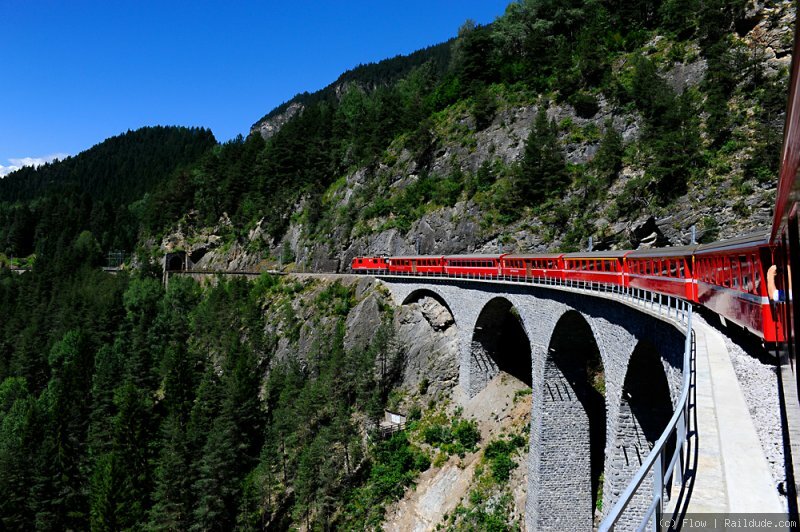 I had met so many wonderful people, friends I will have for life, which I believe is the greatest part of travelling. Opening up to stranger and discovering what it is they love, what are their struggles, their future plans and experiences is like food for the soul. Finding common interest with a person born on opposite sides of the world is exhilarating and I’ve fallen completely in love with it. Which brings me to Simon Wright and Hannah Blake. July 2008, Molson Amphitheater with Mark Hubner was the first time I saw Dave Matthews Band live. February 2010, Dan Hammonds basement with Sam Statham I watched Sidney Crosby score the golden goal for Canada to win the Olympic gold medal and June 2015 at Harmony restaurant with Mitch Bolton and Mike Budd, I saw Simon Wright play for the very first time. There are moments in your life that are burned into your memory with a cattle prong and watching Simon perform was certainly one of them. I am a music lover and a live music fanatic and there aren’t many words in my limited vocabulary to describe how I felt that night: Shocked, awed, amazed, blown away and chills. At one point during his performance he did a remix of the Game of Thrones theme song and being a GOT nerd I could barely contain the little girl scream I wanted to release. I kept it totally cool and just looked across the table at Mike showing him the hairs that were standing up on my arm and he returned the same gesture. I had never experienced a looping machine before and to be honest I wasn’t really paying attention during the first song until I thought there were about 6 people on stage only to glance over and to my great surprise there was just one dude. It was incredible! After meeting Simon and Hannah and discovering that their spirits and personalities outshined his talent was mind blowing. Here are two incredible people, talent and kindness taller than the CN Tower (had to get a Canada reference in here somewhere) and so down to earth. I feel extremely lucky to have seen Simon perform his music and extremely privileged to call them my friends! At this point I’m sure you’re wondering “what happened to George who you convinced to come to Ios with you?” as you should be! Well, George got a 600Euro ticket and had to go home after 3 weeks, I miss him but Ios got the best of him as it does of many people. I myself have felt at times that the island is beating me, which is nearly impossible cause I’m a 6’5 man stuck in a 5’8 frame. Thankfully I’ve met the best people in the world to share my first summer abroad with and I enjoy everyday a little bit more than the previous, meaning to say everyday is the best day of my life on Ios!! What time is it?….. Who Cares. 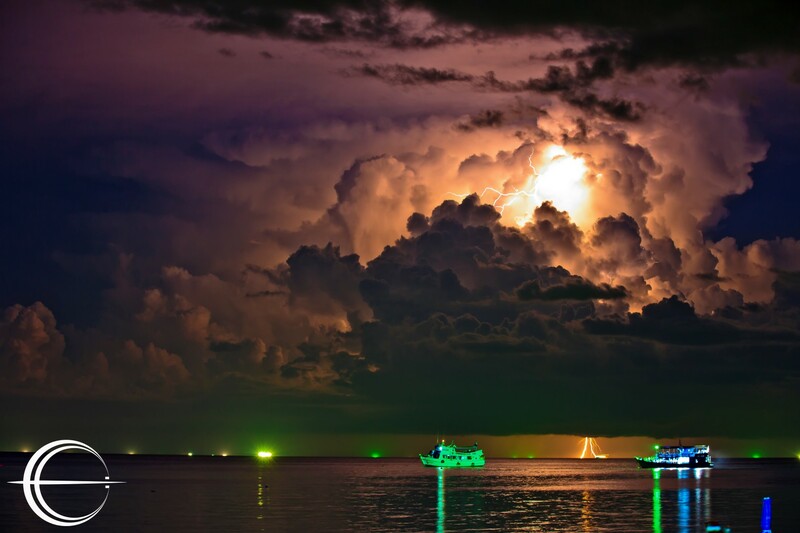 Koh Tao. I should have written this weeks ago. It’s not that I’ve been avoiding it or even putting it off, actually I’ve been looking forward to it. There is an explanation to my laziness but only those that have spent a bit of time on a tropical island will truly understand. Hannah and I have come to refer to this phenomenon as Island time. Tomorrow doesn’t actually mean tomorrow on Koh Tao, it more accurately translates to eventually. The hands on a Koh Tao clock don’t point to specific hours of AM and PM but more a rough target at which we’ll aim. Those that refuse to give up their slave to the routine ways of the cities we live in find it extremely frustrating, but being frustrated will do nothing to change island time. It’s best to give in and let the island dictate your schedule. Today the island decided I’d write my blog post. So here it is. We have been here on Koh Tao, a tiny little island in the middle of the Thai Gulf, for almost 6 weeks now and I have enjoyed every second of it, even the Thai belly, it’s like a constant reminder I’m on an adventure. It does make me worry occasionally when I’m on stage in the middle of a set and I get that turning feeling in my gut, but luckily, so far, I’ve not had to drop my guitar and make a b-line to the closest lavatory. Choppers Aussie Bar and Grill. This gig is mental. 3 nights a week I rock out to 300 sweaty, excited backpackers. My gigging schedule has been hectic. Easily the most busy I’ve ever been as a musician. I’m performing a three hour show every night except Fridays between two venues. 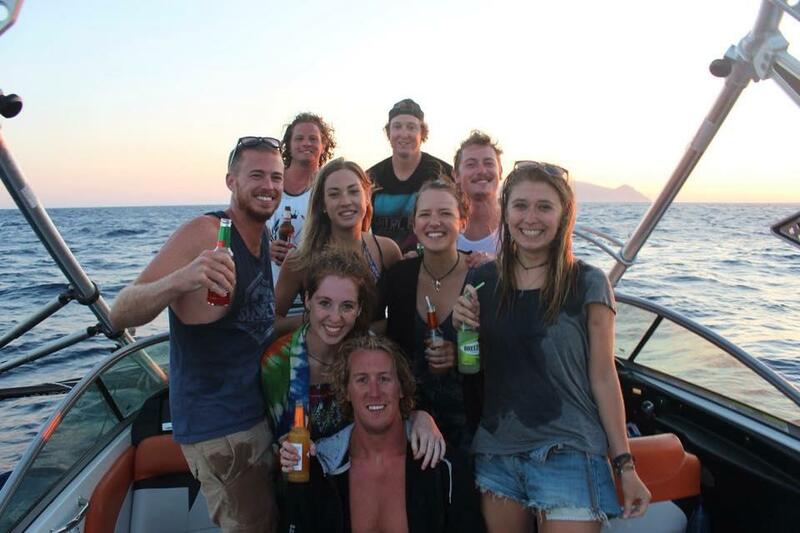 3 nights a week at Choppers Aussie Bar and Grill and 3 nights a week at Fishbow Beach Bar. I’ve also done the odd show at Banyan Bar and Maya Beach Club. It’s getting me fit. I’ve lost about 10kgs and I can now manage the hot, sweaty shows without the assistance of an M-150 or the need for a power nap post performance. Playing every night also does wonders for my progression as an artist and a looper. And though I am working hard, I love my job. It sends me to tropical islands and attracts me to beautiful people. It pays my way and supports my partner. It never boxes me in, rather it encourages me to push the boundaries. And it’s got to be one of the only occupations in the world that inspires the boss to buy you a shot when you’re doing a good job. Tropical hang overs are like tropical storms, they come on hard and fast and no matter how many times you see one the intensity is always awe inspiring. Which brings me too the drinking. 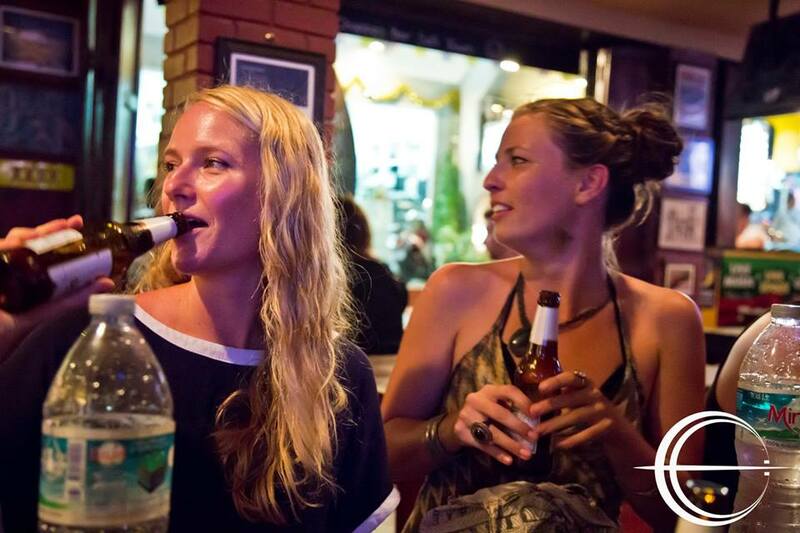 Hang over management is a big part of Koh Tao life. If you are not careful you will end up with the worst hangover you’ve ever experienced. Tropical hang overs are like tropical storms, they come on hard and fast and no matter how many times you see one the intensity is always awe inspiring. The cheaply brewed Thai alcohol mixed with the humid, hot nights of sweating means hydration is a constant battle. These days I steer clear of the cheap Thai whiskeys and just stick to beer. “One beer, one water”. At first I get laughed at like I’m some kind of amateur but the tide turns when I bump into those that were laughing at the 7-11 at 3am and I’m still clear headed and walking straight while they are hunched over a bin throwing up the cheap buckets and late night street food. I can’t help myself but to remind them. “One beer, one water”. Casey and Edan crash the stage at Banyans. One thing that has been so beautiful this month is the visits we have received from back home. A big shout out and thank you has to go to Danielle, Jonno, Mikey, Edan, Casey, Hayley, Dave, Mick and Anthea. It was so amazing sharing this little island with you all. I hope you fell in love with it as I have and it continues to be a destination for you all for many more years. Then from old friends to new friends. I’ve met so many beautiful people on this island and formed some amazingly close bonds. I hope I can keep those relationships as close to my heart as they are now as we move on to the next leg of #looptheworld. Hannah and I will be back on the island in January we think. For those of you that will still be here I look forward to seeing you again. For those of you that will have left Tao, stay in touch. Maybe we’ll come visit you in your country. We are three months in now and the idea of living life on the road still feels fresh and exciting. 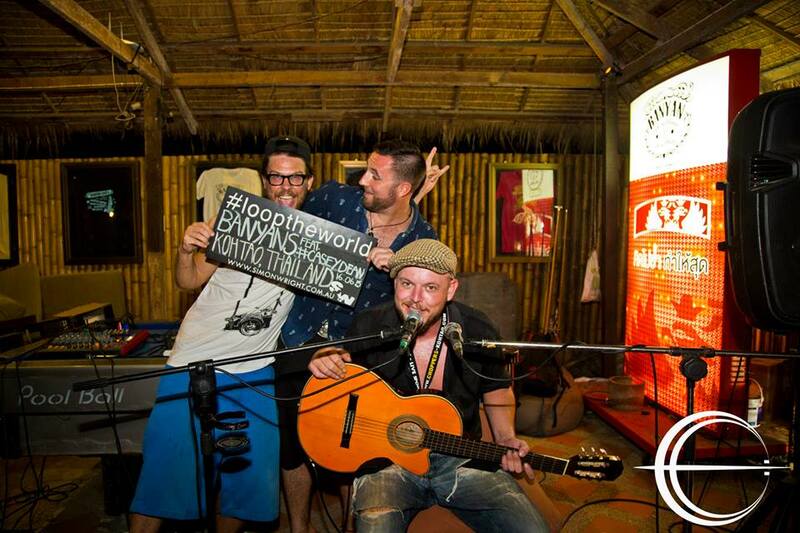 Sadly, on Thursday this week, I play my last show on Koh Tao. Friday we go to Bangkok, Saturday we Fly to Moscow, Sunday to Athens then a ferry out to the island of Ios where I start my Greek Island gigging schedule. 7 Nights a week this time, wow. If you haven’t already please sign up to the #looptheworld Letterbox at http://www.thesimonwrightband.fanbridge.com and don’t forget to leave a comment or write us back. Who’s a good boy? Photos by Edan Chapman Photography.